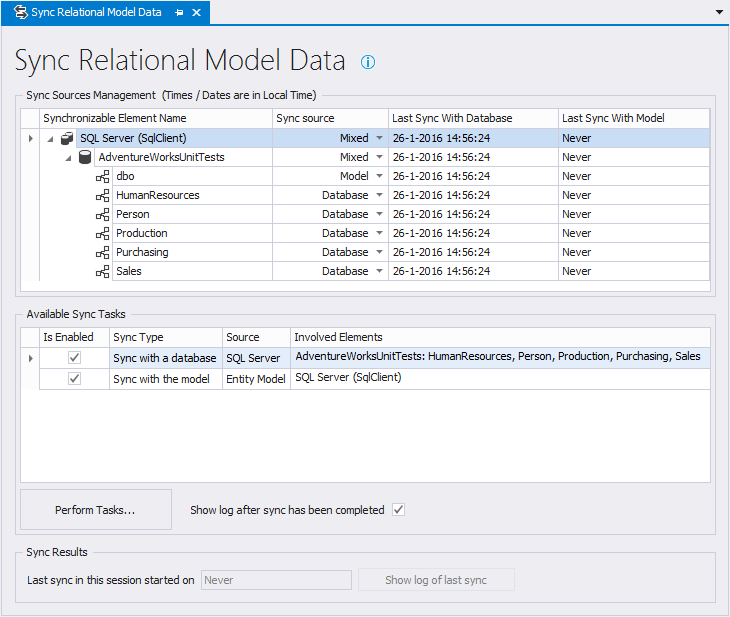 The Sync Relational Model Data tab is the central place to configure and perform relational model data synchronization. This tab is opened by selecting the Project -> Sync Relational Model Data option in the main menu or by clicking the button on the toolbar. Sync Sources management, which is a pane which shows all present syncable elements (database containers, catalogs, schemas) in a tree list structure and their current sync sources. The user can then set the sync sources using combo boxes in the treelist, in one central point without having to navigate through the catalog explorer tree. The dates / times are in Local time. Sync Results, which is a small pane with the last sync date/time of the session (not stored in the project file) and the last log of that last session, so the user can check these later if the form has been closed. Everything is automatic, if you change a value, the tasks are re-created, so they're always up to date. Sync doesn't perform DDL SQL export / SQL migration, you have to export and run DDL SQL scripts manually as that's in line with the philosophy of the LLBLGen Pro Designer. Mixed. This means the relational model data is obtained from the database for implied elements (stored procedures, table-valued function calls, views, sequences), and from the model for tables. If you want to have your entities being forward mapped onto tables ('Model first') but also want e.g. views or stored procedures in the same schema obtained from the database server, you can: set the sync source for the schema to Mixed. When an older project is loaded into v5's designer, or is converted from v2 to v5's format, there are no sync sources defined, and the designer will pick a default which is Database. When you sync the relational model data, the designer will start the synchronization process for all relational model data and make sure the data is synced with their sources. The list below shows what the designer will do with a given element for a given sync source. Mixed: it will refresh every catalog with the database server and it depends on the schema sync sources whether their tables are included. Model: it will sync the tables / sequences with the entity model. Mixed: it will refresh the catalog with the database server and it depends on the schema sync sources whether their tables are included. Refreshing a catalog with sync source set to 'Mixed' or at least a schema with sync source set to 'mixed' will retrieve meta-data from the database server but there is no table meta-data retrieved for these schemas. The user is therefore not able to (de)select tables as they're synced from the entity model. Sequences are retrieved in this scenario however. Based on the relational model data elements in the project and the selected sync sources for these elements, the designer creates Sync Tasks, which are shown in the Available Sync Tasks area in the Sync Relational Model Data tab. Per task the source and the involved elements are given as well as an option to enable/disable the task. To perform the tasks in one go, you click Perform Tasks. By default a log is shown with all the actions performed during the execution of the enabled tasks. If you don't want a log to be shown, uncheck the checkbox Show log after sync has been completed. The default value for this checkbox is set in the Designer preferences setting Show report after relational model data sync. See for more information regarding Sync Tasks the Sync Task Aspects section.